It feels like it was just yesterday that the Penguins were finding a way to lose the series to the NY Rangers. 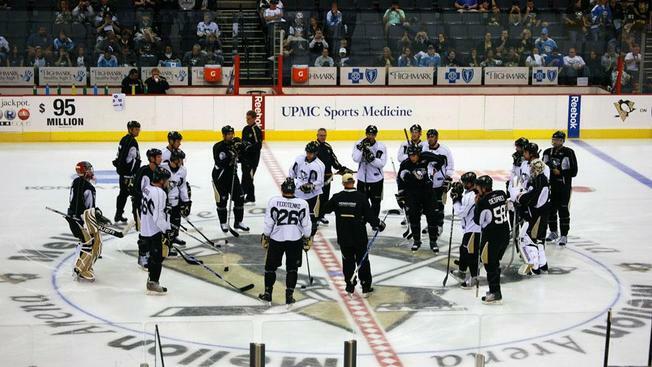 Somehow it is already September 22, and the Penguins' first preseason game is tonight against the Red Wings. For my article this week, I will be detailing five predictions for the upcoming season. For the readers, only keep track of these predictions should you find they start occurring. Otherwise, forget I ever wrote this in the preseason. Thank you! "I don't know. It's hard to say. I've always likes to be around of the net and take the battle and work hard for loose pucks. Then when I came over here [to North America], they put me in front on the power play. I try to work on it every single day. I have small size, I know that, but if you work hard enough, you know you're going to get some pucks. " That doesn't seem like much now, but that should make Pens fan very happy. I think Hornqvist has a career year and a solid postseason. It is one that will make even the staunchest Neal supporters say, "James who?". A big, talented defensemen and a proven winner at the NCAA level, Brian Dumoulin possesses the smooth skating stride of a player much smaller than 6'4, 219 pounds. Though not known as an overly physical player, Dumoulin possesses the strength, size, and balance to keep the front of the net clear of traffic. The defensemen is also an adept puck-mover with a hard point shot. Conducting himself with great confidence on and off the ice, Dumoulin possesses numerous traits which suggest he could develop into a reliable top-four defenseman in the NHL, most notably his ability to quickly retrieve the puck and move it up ice. Sound like a player that could thrive in the system Johnston is trying to implement? I think Dumoulin has somewhat of a coming out party this season, and he is one of those names people will be talking about in April and May. I think an argument can be made that this is my boldest prediction thus far. For the record, I have Downie penciled in for 15 goals and 20 assists. I also think he finishes the season right around 30 penalty minutes. Downie's career season was in 2009-10 with the Tampa Bay Lightning. He finished with 22 goals and 24 assists. It is no coincidence this was the time he spent alongside Martin St. Louis and Steven Stamkos. Playing in Pittsburgh with Crosby, Malkin, and Kunitz will be arguably the best talent he has ever played with. Due to the lack of top-six wingers currently on the club, I think Downie finds a good deal of time on the top two lines. He has had shoulder surgery in 2012 and reconstructive knee surgery in 2013. Currently, he is the healthiest he has been in the past four seasons. By the way, it is worth mentioning that Rick Tocchet was Downie's coach when he put up those career highs in the 2009 season. Given all of that, 35 points does not seem like much of stretch, but the boldest part of that prediction is that his point total will exceed his penalty minutes. Downie has 776 penalty minutes in 336 career games, or 2.28 PIM per game. Last season that number dropped to 1.71 PIM per game. Still not exactly a saint. I am basing most of this prediction on management and because I have seen a player reform his game in this past. Let's remember that Downie has cross-checked a teammate in the face during junior hockey, earning him a five game suspension. Let's also remember that Downie was suspended 20 games, the eighth longest in league history, for leaving his feet when delivering a blow to Senators' forward Dean McAmmond's head. Let's also remember that Downie has been suspended 20 games for slashing a linesman. Not exactly the resume that evokes confidence this prediction will come to fruition, but I believe Downie will be a different player for Pittsburgh. He has been clean, so to speak, for nearly six seasons. I do not think management brings in a player like Downie unless they think he has changed. Their history with the league is pretty apparent with Mario calling the league a garage league in 1992, and Lemieux strongly criticizing the NHL after the ugly series of incidents with the NY Islanders in 2011. I do not think they stand for any shenanigans from Downie. Why else do I think Downie can reform his game? Because I have seen it once already with Matt Cooke. Assuming Downie can do the same thing, he will be a great asset to this team. 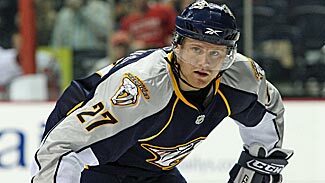 Losing Patric Hornqvist in the draft day trade for James Neal is tough on the Predators – no question. He's a lock for about 20 goals per season. Losing Nick Spaling is probably more difficult. The youngster is versatile – he could play every forward position – and was starting to find his range in the NHL...Spaling does have this type of two-way grit, offense and versatility that is tough to find in the NHL. Sound familiar? I see a lot of similarities in Dupuis and Spaling. With Dupuis at 35 and coming off of a serious knee injury, I can see Spaling step into his type of role on this team very quickly. I also think that Spaling, like Dupuis, will become a fan favorite quickly. His straight line, yet versatile game, is one that endears itself to fans. If you have been with me so far, this is where I may lose some people. Fleury's triumphs and tribulations with the Penguins have been well-documented. He was an integral part of the 2008-09 Stanley Cup team, and he has also sat on the bench in the postseason during some pivotal series the past few years. 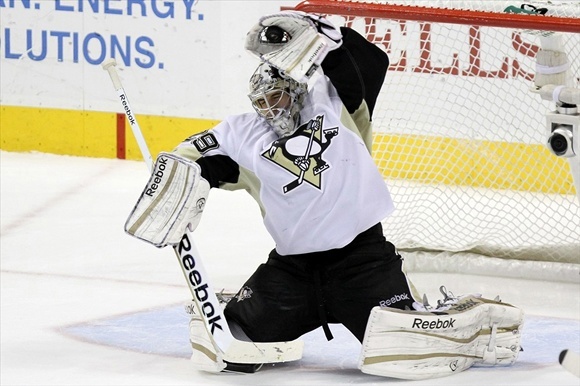 He has been great in the regular season and holds the Penguins franchise record for wins. He is also known for giving up some truly soft goals when it really matters. After a disappointing postseason in 2013 that saw Fleury watching Tomas Vokoun try to lead the team to a Stanley Cup, Fleury consulted a sports psychologist in the offseason. Seeing Fleury play all last season, I think it was the most comfortable I have seen him in net. He had a solid regular season, as usual, but his postseason was where it really counted. He posted a .915 save percentage, and 2.40 GAA. Those were the second best postseason numbers of his career. He has always had the raw skill, but now he has the mental toughness to lead this team. He is also in the final year of his contract. We have seen this countless times in a variety of sports where players have a career season in the final year of their contracts. They are playing for themselves, their families, and their future. I also think, from top to bottom, this may be the most sound defensive squad Fleury has had in front of him. Between the forwards that left and the forwards that were acquired, Fleury will see a huge boost in two-way play. For all of these reasons, I think Fleury is right there at the end of the season to win the Vezina and ultimately does it. I also think this means Fleury is in the Burgh for the long haul. Well, those are my five big predictions for this season. I would absolutely love to hear some of your thoughts in the comment section below, or follow me on Twitter @PandaPSU. Let me know what you agree and disagree with, and I think we can all be excited that it is finally hockey season once again! Agree with Fleury. He is never going to be the next Brodeur, but just has to be a Bill Ranford type to find success. With the improved defensive presence he will get the additional help he needs to cut down on rebounds and break away's and force shots to the outside and giving him room to see/save properly. Vezina is a stretch but with the same effort as last year, it isn't far fetched by any means. As for Downie I think he will hit towards 50 points, potentially having a career year. He has the overall talent to do it, plus the motivation to prove people wrong and if given an opportunity I think he will make the most of it. 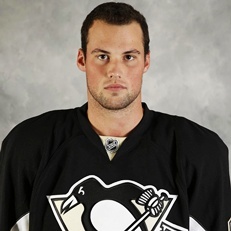 As for Dumoulin - I like him a lot and agree, this guy is top 4 material. The question mark this season is a guy named Despres. Sure Martin would be a perfect trade candidate, but even to get reasonable value, Despres will have to be showcased and given the time accordingly.